Every new quarterly report is fascinating, packed with reasons for both optimism and dread. The more time I spend following it, the less sure I am of how things will ultimately end for the stock. The company grew from nothing to a dominant industry force in a little more than a decade... And yet, at the same time, it's the perfect example of how not to run a business for the long haul. First, Netflix is an industry disruptor. After decimating the video-rental business, it wreaked havoc on cable TV. And it's now squaring off with the old-guard media titans by creating its own original content. Plus, Netflix is huge and still growing like a weed. As of this past September, the company had nearly 140 million subscribers – growing by almost 20 million in the first nine months of 2018. And while domestic growth is likely to slow, international growth is just getting started – and has actually accelerated in recent months. Finally, Netflix has incredible pricing power. Right now, the standard Netflix plan is just $11 per month. But consumers are streaming a lot of Netflix content, and that means the company can increase its prices with virtually no long-term effect on subscriber retention or growth. We compete for entertainment time with linear TV, YouTube, video gaming, web browsing, social media, DVD and [pay-per-view], and more... As Internet entertainment grows, more companies see the large opportunity. In particular, Netflix is competing against traditional media companies like Disney (DIS) and Time Warner's HBO, which are starting to focus more on their own streaming services. Apple has Apple TV. It's starting to invest in its own content. And its $240 billion pile of cash is larger than the GDP of most countries. Google owns YouTube, the No. 2 streaming site behind Netflix, which is also investing in premium content. Amazon's Prime Video is a rapidly growing No. 3 contender. CEO Jeff Bezos – who seems to be taking over every other industry – has recently declared video as a likely "fourth pillar" focus for the company. Not only do these three companies want to provide you with content, but they want to control the "pipes" for how you consume it. They all have operating systems – Apple's iOS, Google's Android, and Amazon's Alexa – whose goal is to be the operating system for your life. That means on your phone, in your home, and pretty much everywhere you can imagine... And that includes making their own offerings the default way for how you watch shows and movies. Netflix has a dirty little secret: It's burning through cash like no other media company on the planet. This is by far Netflix's biggest problem, and one that it will eventually need to solve if it's going to survive. The worst part is, the bigger Netflix grows, the more money it loses. You won't see this on its income statement. The company has changed its accounting methodology to make sure of it. According to the income statement, Netflix is profitable. It generated more than $500 million in net income in 2017, and analysts expect that to double this year. But as any vigilant investor knows, net income doesn't always reveal a company's actual earning power. To get that, we must look at a company's free cash flow ("FCF"). We call FCF "the number that doesn't lie." FCF is what's left after a company pays for all cash expenses and capital investments. That makes it a great measure of a company's true earnings power. It can use that FCF to reward shareholders through dividends and buybacks, or to invest back into the company for incremental growth. It's worth noting that sometimes the profits reported on a company's income statement understate its earnings power. That's often the case with subscription businesses such as Stansberry Research or a software-as-a-service ("SaaS") provider. These businesses generally receive cash up front – sometimes for long-term service relationships – and record revenues and profits over time. But in the case of Netflix, it's the opposite... The company's income statement vastly overstates its earnings power. In 2018, we expect to spend close to $8 billion on a [profit and loss] basis on content for our members. Now, $8 billion is a ton of money to spend on content – more than any other company spends, besides Disney. But the problem for investors is that the amount Netflix will actually spend this year – on a cash basis – is more than $12 billion. Rather than recognizing all of this spending today, Netflix delays the hit to its profits. Management argues that the useful life of this content is far longer than just a year, so the company should spread those costs over time. But this makes Netflix's financials aggressive... and misleading. Over the past five years, Netflix has reported a total of $1.2 billion in net income. 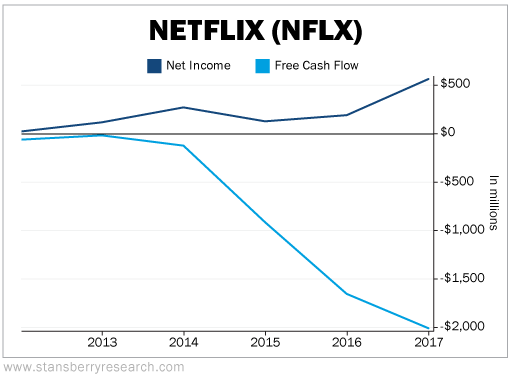 But over the same period, Netflix hemorrhaged free cash flow every year, for a total of negative $4.8 billion... or a difference of more than $6 billion between the profits Netflix reported and the losses it actually generated. But it gets even worse... Netflix has already forecast FCF losses of $3 billion to $4 billion in 2018 and 2019 – each year. This amount of negative FCF is shockingly bad for a company expected to generate less than $16 billion in revenues in 2018. For every dollar of revenue it generates this year, Netflix expects to lose around $0.25. How's that for a viable long-term business model? With continued "success," we will invest more in originals, which would continue to weigh on FCF, even after we achieve material global profitability. As a result, we anticipate being free cash flow negative for many years. Investing in the stock today means you're signing up for billions in losses per year for the foreseeable future. As I explained earlier, the company is an industry disruptor, is growing rapidly, and has tremendous pricing power. Still, FCF would have to dramatically change for the better before I'd tell any investor to buy shares. That could happen... Netflix could grow its user base faster than its content spending. But over the past eight years, the company has grown its subscriber base by 29% per year while growing the cost of its content by 54% per year. As an alternative, Netflix could take advantage of its pricing power and raise the cost of a subscription on a happy user base that would be likely to oblige. But until then, investors should stay far, far away from Netflix. It's growing too fast and its customers love it too much to sell short today... But its market is too competitive, and its cash flows are too negative to go long. And over the past nine years, it has been a great example of a stock that can soar during a bull market starved for growth companies. But it also represents a great lesson on the difference between accounting net income and true free cash flow. Ultimately, you can't ignore FCF. When the bear market finally arrives, Netflix could become the poster child of what not to own. By then, no one will care that Netflix added 1 million subscribers if it burned through billions of dollars to get them. "One of the most valuable tools in any investor's tool kit is a basic understanding of corporate financial statements," Austin says. Learn more about what he looks for in a company's financials here: Three Tools to Add to Your Investing Tool Kit. "How do you know you're making 'A+' investments in your portfolio?" Austin asks. Get the details on his three steps to evaluate your investing results right here. Just look at Cracker Barrel (CBRL). The $4 billion Southern-style restaurant and gift shop chain is consistently listed among the top family-dining destinations in consumer polls. While upscale restaurants may live on the razor’s edge, this company succeeds by sticking to its “simple” roots. Its same-store sales have grown over the past five years… And on Tuesday, Cracker Barrel’s stock jumped nearly 5% after the company beat consensus estimates for the latest quarter. 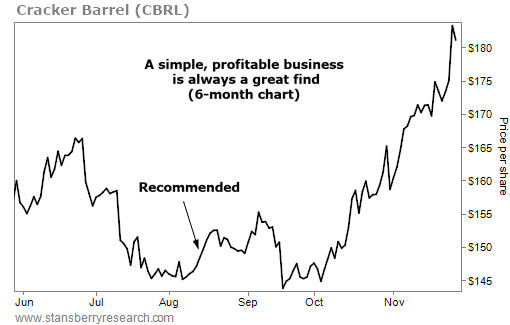 Our colleague Dr. David Eifrig recommended CBRL shares to his Income Intelligence subscribers in mid-August… Since then, the stock is up 22%, and it recently hit a new 52-week high. Congrats to Doc on another great call! Subscribe to DailyWealth for FREE. Receive wealth-building advice delivered straight to your inbox. Dr. Steve Sjuggerud is the Founding Editor of DailyWealth and editor of True Wealth, an investment advisory specializing in safe, alternative investments overlooked by Wall Street. He believes that you don't have to take big risks to make big returns. Since Steve joined Stansberry Research in 2001, he has found super-safe, profitable investment ideas for his subscribers that the average investor simply never hears about... until the big gains have already been made. For example, Steve recommended buying gold back when it was trading around $320 an ounce. The best investment ideas in the industry, sent to you each morning... before the markets open. Protected by copyright laws of the United States and international treaties. This website may only be used pursuant to the subscription agreement and any reproduction, copying, or redistribution (electronic or otherwise, including on the world wide web), in whole or in part, is strictly prohibited without the express written permission of Stansberry Research, LLC. 1125 N Charles St, Baltimore, MD 21201. We believe that you can make a lot of money – and do it safely – by simply doing the opposite of what is most popular. Sign up for a FREE subscription to DailyWealth and you'll receive wealth-building advice delivered straight to your inbox, daily.